ASMARA, ERITREA (BosNewsLife)-- Several Eritrean Christians involved in a recent evangelistic meeting in Eritrea remain behind bars while other believers are in hiding, Christians with close knowledge about the situation say. The troubles began in July when the first flight from Ethiopia to Asmara in more than 20 years arrived with Pentecostal evangelist Surafiel Demssie among the passengers. After arriving in Eritrea's capital on July 18, Pastor Demssie held an informal evangelistic street meeting, according to activists. "He left shortly after and that was when police moved in," said advocacy group Voice Of the Martyrs Canada (VOMC) which closely monitors reports of persecution in the region. "At last report, five people were arrested, and others have gone into hiding. One of them, believed to be the host of the meeting, was arrested at the airport", VOMC stressed. Family members learned that the five Eritreans had been detained "for blocking the street" and would be released shortly, Christians said. But officials from the National Security Agency responsible for the arrests reportedly declined to free the believers. The reported crackdown on evangelism comes at a time that conversion to Christianity is seen as a complete betrayal of community, family and the Islamic religion in Eritrea, activists say. "To date, those apprehended have not appeared in court. 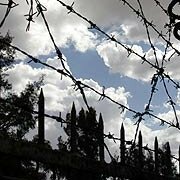 It is common for prisoners of conscience, including Christians, to never face formal charges, despite lengthy imprisonment under horrific conditions," VOMC explained in a statement to BosNewsLife. It urged its supporters in a newsletter to pray that as "new relations develop between these two East African nations" authorities will grant " discernment to the Eritrean Christians along with hundreds of other believers currently being held in custody for their faith." VOMC also asked prayers so that "the Lord gives great strength and courage to these innocent prisoners as they await deliverance and a tremendous sense of His peace to each of their concerned family members." The reported incident came as a setback for Christians who said they hoped a recent peace agreement between Eritrea and Ethiopia could also lead to a relaxation of "human rights violations and religious oppression" in Eritrea. While the exact number of Christians currently imprisoned for their faith is unknown, thousands are known to have been detained and jailed over the years, according to local Christians and several rights groups. Many are known to suffer in shipping containers or other harsh conditions, BosNewsLife learned. "We have reports of numerous believers being imprisoned for more than ten years," said Open Doors, a respected aid, and advocacy group. "In 2016, reports surfaced that at least three Christians died for their faith: two men died of hunger and thirst in Maitre prison, and a 28-year-old woman died in the same prison from an untreated infection." Open Doors says the government and the cultural climate in Eritrea contribute to the persecution of Christians in the Horn of Africa nation. The "regime" of President Isaias Afewerki is known for "absolute authoritarianism," Open Doors added. "The arrest, harassment, and murder of Christians accused of being agents of the West are commonplace." Additionally Muslims, who make up roughly half of the population of over 5 million people, are becoming more radicalized, "resulting in increased vulnerability for Christians living in their vicinity," Open Doors claimed. Critics say that the influential Eritrean Orthodox Church (EOC) also has a long historical presence in the country and persecutes believers who leave the denomination. President Afewerki denies wrongdoing in his one-party state, which faces accusations of both suppressing democracy and devoted Christians. He says that critics wrongly understand his perceived tough stance towards, especially, evangelical believers.